You are the first one in the office and the last one to leave. You have the experience and/or the education, certifications and licenses, yet promotions and raises elude you. You're doing all of the "right" things but you aren't making any significant progress in your career. It's time to take control. It's time for some new career management strategies. The time to act is NOW! Join us at the next installment of the Guided Wisdom Series where we will discuss Career Advancement Strategies that can help you accelerate your career to new heights! Gain priceless insider tips that will help you navigate the corporate and business landscape with fluidity and grace. Learn how to be viewed as a valuable member of the team, and achieve the rewards that you deserve. 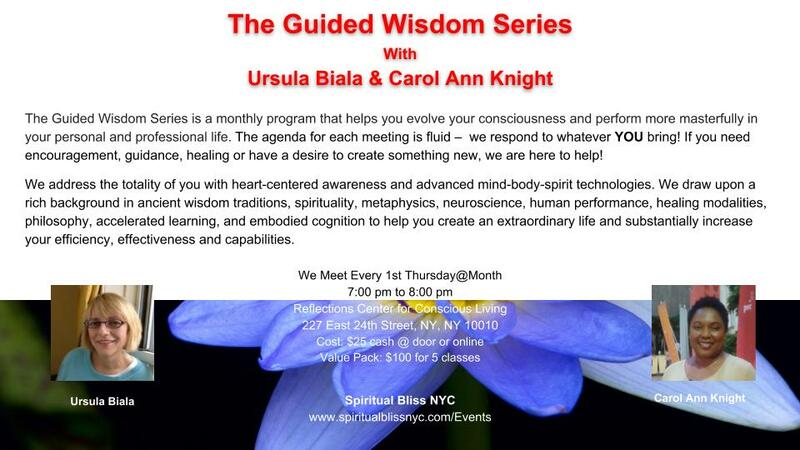 The Guided Wisdom Series is a monthly group event that helps you evolve your consciousness, and perform more masterfully in your personal and professional life. We draw upon a rich background in human potential, accelerated learning, ancient wisdom traditions, spirituality, healing modalities, NLP, and embodied cognition to help you create an extraordinary life, and substantially increase your efficiency, effectiveness and capabilities.